Valve tappet covers to fit the Honda SOHC CB750, CB550, CB500, CB400, CB350. 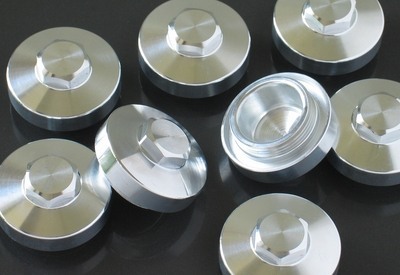 This set of 8 valve tappet covers is precision CNC machined from tough 7075 aluminum alloy. 7075 is an aluminum alloy, with zinc as the primary alloying element. It is strong, with a strength comparable to many steels, and has good fatigue strength. Designed to fit the SOHC Honda CB750, CB550, CB500, CB400, and CB350. They will also fit the Z50, Z50R, SL70, as well as many other Honda models. They replace Honda OEM part #12361-300-000.